The media was out in full force the day Steve Kragthorpe was introduced as U of L’s new football coach. Half a hundred strong, they were encamped at Press Level of Papa John’s. Cameras whirred, flashbulbs popped and microphones clicked on as the elevator doors opened and the new mentor emerged with an entourage led by Tom Jurich. The group strode as royalty toward the fourth estate. Suddenly, Kragthorpe hung a quick, sharp left into the Mens Room for a pit spot. “There’s the money shot,” chirped one wag. A year ago Louisville coulda been a contenda. The Cards were defending Orange Bowl and Big East champs. Now the program is up on jacks. No pit stop, this is a major overhaul. The defensive coaching staff is new. The offensive coordinator is new. The field commanders who will lead the team are new. The red and black faithful, Tom Jurich who has seats to sell during stadium expansion and a beleaguered coach who had to hold a presser to say he wasn’t being run out of town all pray those are significant upgrades. Kragthorpe 2.0 will be released 8.31. Starting QB Hunter Cantwell completed eight throws last campaign. Leading returning rushers, Brock Bolen and Bilal Powell, tallied only 643 yards. The three top receivers back nabbed only 52 catches, eleven of those by a Trent Guy who is recovering from a gunshot wound. The three top returning defenders had only four sacks, seven tackles for a loss and one pick among them. When have Louisville fans, just now starting to recover from last season’s free fall, had so many questions? For every positive — eight home games — there’s a negative, i.e. a linebacking corps that barely exceeds Toy Bowl height and weight maximums. For every credit — Ron English was National Defensive Coordinator of the Year at Michigan in ’06 — there’s a debit. Remember Appalachian State in ‘07? The defense has to be better, if only because it can’t be any worse. “With coach English it’s a lot more organized than last year,” according to safety Bobby Buchanan. “Our new system is a lot simpler. “This year we’ll disguise our defense more. Last year teams would always know what we were doing. Frankly, simply lining up in proper position will be an improvement. The word “nasty” keeps cropping up when talking to those involved on the other side of the ball. Offensive coordinator Jeff Brohm used that n-word when addressing reporters. Hunter Cantwell used it also when we chatted last week. The attack plan will be different. “This season we’re going to run to set up the pass,” says Brock Bolen, the Cards’ leading returning rusher. My sweetie threw out the tea leaves. There are no ink blots to examine in this computer age. The crystal ball is cracked. I have no idea what surprises, if any, this team might have in store. If freshman stud Dexter Heyman plays as good as he looks, the defense might amaze. If Hunter Cantwell steps up like Stefan LeFors, all could be well when Louisville has the ball. 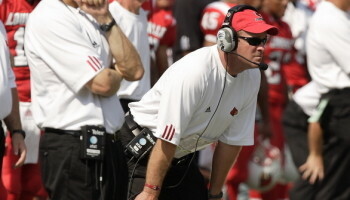 If English and Brohm add value as Louisville fans hope, it could be exciting.